Turtle Creek has introduced a new security decal initiative in 2016. Residents will be asked to place a small decal on all vehicles that reside in the neighborhood. Use of the decals is voluntary. If you need a security decal, please contact a TCHOA board member or get them at the next general meeting. The decals will assist the security patrols in identifying resident traffic thus allowing them to focus more attention on non-resident vehicles. These reflective decals will also work in tandem with the new security cameras to help easily identify non-resident vehicles in the event of an incident requiring video review. 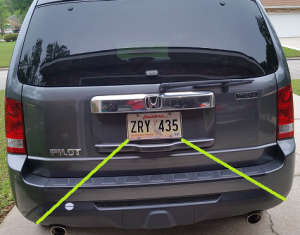 Place decal, horizontally, somewhere along the green line between the corner of the license plate and the corner of the bumper. Either side is acceptable.